I am so flattered that Kimberlee from The Spunky Diva nominated me for a Beautiful Blogger Award. Blogging has been such a wonderful experience for me and I am truly grateful to have met so many amazing people! Kimberlee is definitely a sweeter than maple syrup kind of girl....and her blog is one worth visiting:). 2. Share 10 things about yourself. So....ten things about me. I am actually at a loss of words, which is highly unusual:)! Instead of trying to dive deep into the dusty archives and analyze who I really am, I thought I would give you a glimpse of what a farmgirl's life looks like in any one day. I think it is a good portrayal of who I am:). 1. It is past 11pm, and I am in my blue flannel pajamas, canning strawberry jam and blogging in between boiling jars. I forgot to put on my apron and there are jam streaks all down the front. I figure I will smell positively delightful all night. The aroma of cooked strawberries should be bottled into a perfume anyway. I would totally buy it. 2. We spent a good portion of our day staking down the wheel lines. The wind was howling and we had 50 mile an hour gusts. With the irrigation turned off those lines will roll away! I was on my way to town, and decided we should check once more before leaving. I loaded the kids and, yes, drove our minivan down the hay field to take a peek. Sure enough, I parked and one of the lines started to jump the T-post wedged against its massive wheel. Hubby showed up just in time to bring railroad ties to hold her down:). 3. "Sickie Chickie," our incredibly unlucky/accident prone chick, was found walking. It's a miracle. We thought she broke her leg, but somehow she has made a comeback....yet again. The first month we had her, she had trouble with bowel movements. The second month she almost was pecked to death....and now the broken leg. Needless to say, she has been a great project in specialized animal care for the kids! 4. I am somewhat of a perfectionist and truly believe less is more. Everything has to have a place, otherwise I can't find it! I have always admired people who can have a little clutter and know where something is. Me...it just ends up gone forever if there is not a spot to put it :). 5. I come from a big family. We are a tight group and truly love getting together. This past weekend, all 8 cousins were lucky enough to spend time with each other. We laugh that they act more like brothers and sisters than cousins. 6. We homeschool our four wonderfully witty kids. They never cease to amaze me. This year, I will be teaching grades 6 to preschool. I love that the kids are so close and that we can tailor their education. They are involved in many community and church activities, so I feel like they have the best of both worlds. 7. I am diabetic. Have been for 12 years now. I was diagnosed with gestational diabetes with our first child, and kept it. There is no family history...except possibly a Great-Great Grandpa. I found a picture of him and his legs had been amputated. My Grandpa remembered that he couldn't eat sugar. I know it might sound counter active, but I am grateful I in many ways for diabetes. Really, it is not that difficult to manage and sure gives you a GOOD excuse to foster healthy habits. I am definitely not perfect, but I can proudly say that I have had four healthy children and have absolutely no complications from the disease. 8. I am hoping to start pressure canning this year and am on the hunt for a great canner. I am also on the look out for a camera. All of the pictures on my blog so far have been made possible by my sister, who graciously lets me use her new Nikon d5000 on a whim:). Her name is Charity, but we prefer to call her Cheech:). My life would be nothing without God. OK, I think I am over my limit of listing only ten things:)!! Robin at Keep Home Simple. 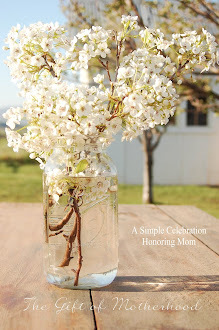 She has amazingly simple tips each day and some wonderful projects:). She is also sweeter than pie. Congratulations, Julia! You are most certainly a beautiful blogger. I received the ruffle pants today and they are absolutely adorable!! And I love your little tags inside. Thank you so so much again! Julia you are too kind. Thank you so much! I'm very flattered!